Weddings are spectacular events, but when it’s a Royal Wedding, the pomp and circumstance is at its peak. Everything is perfect and everyone dresses to perfection. It goes without saying that at a Royal Wedding, the Princess (or Duchess) bride must look stunning. One of the most heavily anticipated part of the wedding ceremony is the wedding dress. What will it look like? Who is the designer? How long is the train? 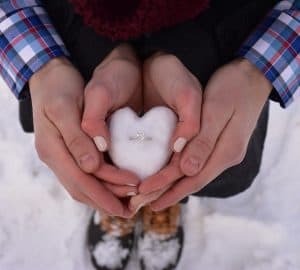 How long is the veil? This post contains eighteen of the most beautiful wedding gowns from recent years. I chose each one primarily due to its attention to detail and overall beauty. 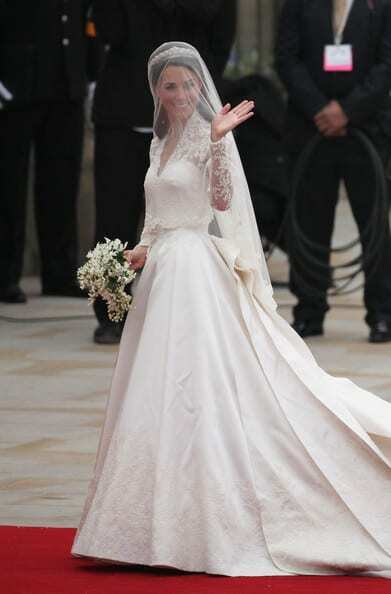 Kate Middleton wore one of my favorite wedding dresses of all time. 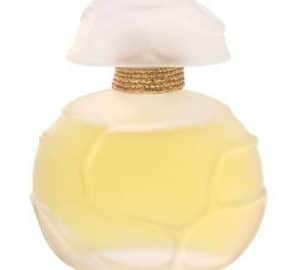 It is classic, yet modern at the same time. Sarah Burton for Alexander McQueen designed this dress working closely with the Duchess to match her wishes with the design. The collaboration was magical! 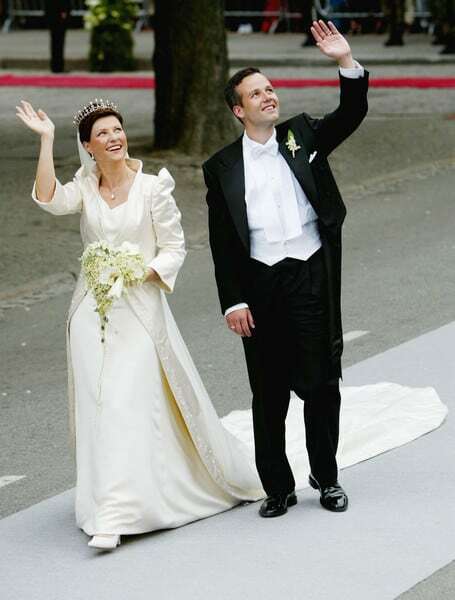 I love this gown worn by Crown Princess Mary because of its simplicity. 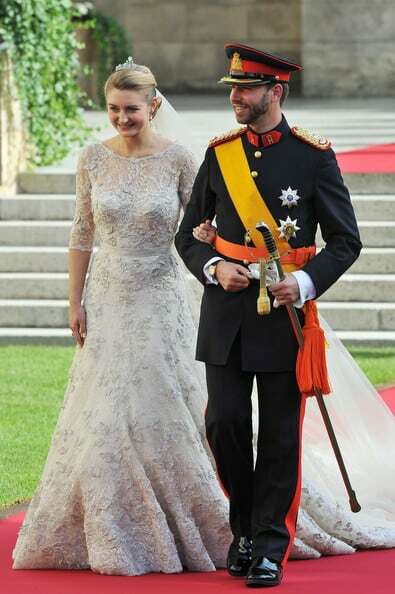 This simple dress draws attention to the Crown Princess’ beautiful face and her gorgeous lace veil. 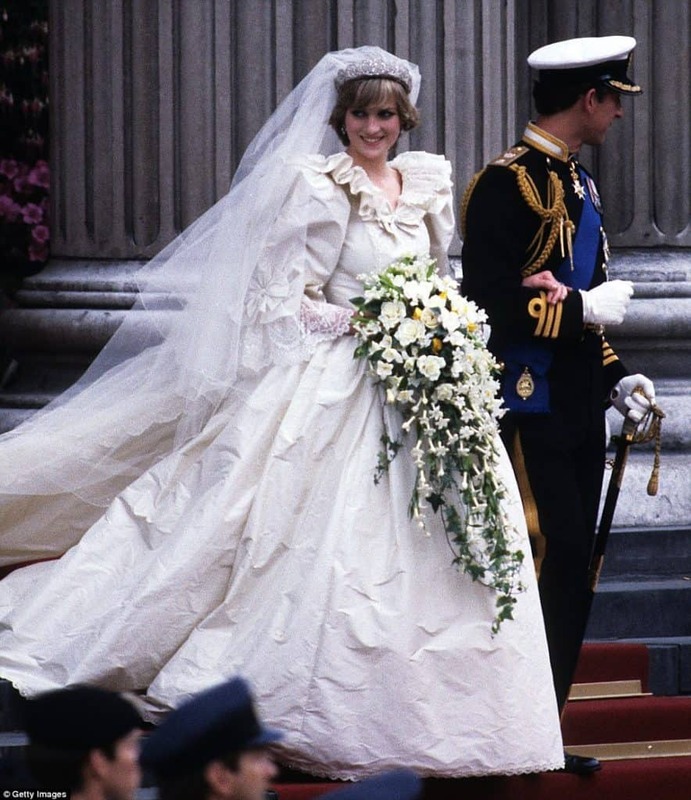 Princess Diana’s wedding gown was very en vogue for the 1980s. With the puff sleeves and voluminous amount of silk, Princess Diana’s dress is still iconic. Meghan Markle selected British designer Claire Waight Keller who is the Creative Director for the French design house Givenchy. It was somewhat unorthodox for the soon-to-be Duchess to choose a design house that isn’t British, but the designer, Ms. Keller, is British so that point was mostly overlooked. As for the wedding gown, it had a boat neck collar which has become the Duchess’ look du jour. The sleeves were 3/4 in length. It was a relatively simple gown that was demure enough to showcase her elaborate veil. The Duchess’ veil was very long in length and had the symbols of all the British territories as the detail of the train. The entire ensemble was truly breathtaking. 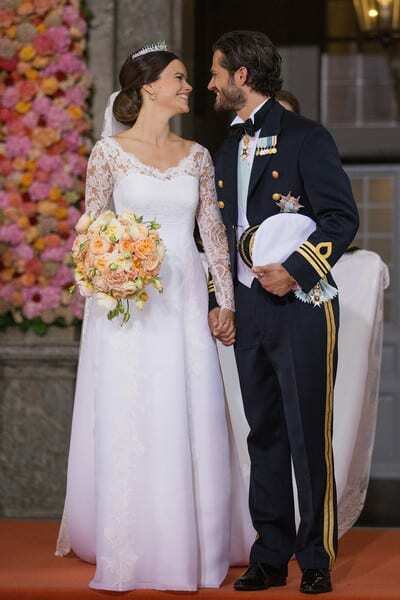 The Norwegian Princess was a picture of royalty in this lace wedding gown. What’s most striking about this dress is the collar and the beautiful, most likely, heirloom necklace that shows off the decolletage. The collar juts out from the bodice creating a beautiful neckline. Armani created a masterpiece for Princess Charlene of Monaco. 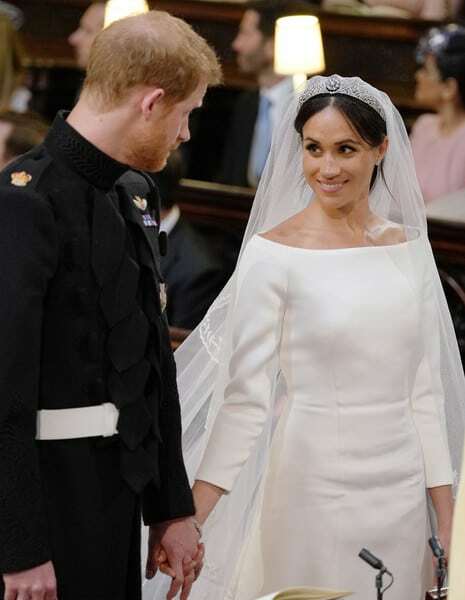 The gown’s neckline is boat neck (similar to the wedding gown of Meghan, Duchess of Sussex). This wedding dress is incredibly elegant with detailing down the front of the gown. The train looks long and ornate, but it’s difficult to tell in this photo. Choosing to ensconce yourself in lace on your wedding day is a perfectly wonderful idea. To have designer Elie Saab create the dress with all over lace is perfect! Elie Saab is one of my favorite designers. I love his couture and RTW collections, and, of course, his line of wedding dresses. The wedding gown and veil are stunning! 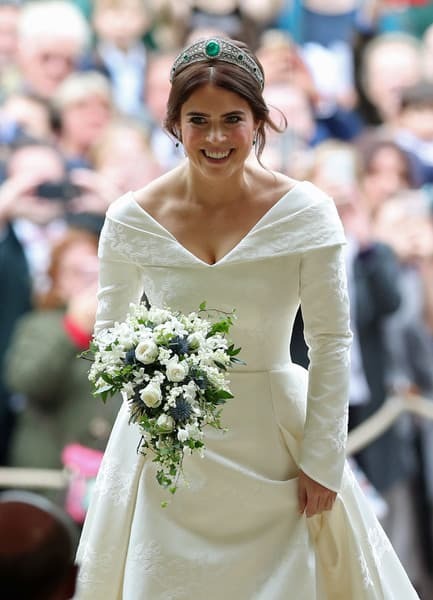 The dress was simple and elegant: white, pure and sculptural with long sleeves, a portrait neckline that folded around her shoulders, and a specially designed sweeping back that showed off the bride’s scars from an operation to straighten her spine. In a break with tradition, the bride did not wear a veil. She did, however, wear the dazzling Greville Emerald Kokoshnik tiara, lent to her by her grandmother, Queen Elizabeth II. 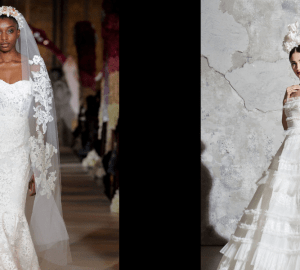 Valentino always gets it right, especially when it comes to wedding dress. This wedding dress is definitely one of my favorites because of other its attention to attention and its simplicity. The tiara and veil are understated giving the bride a more polished look. As for the gown, the fitted bodice contains a lace neckline. The full skirt completes the look because, according this photo, there is no train on the gown that can be seen. This wedding dress has cap sleeves and a stunning box-shaped neckline with a simple tiara and veil. The thinly-lined skirt creates a modern look. Perfection for a princess. A sweetheart neckline and full skirt combined with a flowing veil on a stunning tiara completes this beautiful, classic bridal look. This wedding dress contains a simple, boat neck neckline with 3/4 length sleeves to complete the bodice. The full skirt and tiered veil attached to a beautiful tiara creates the perfect bridal look. 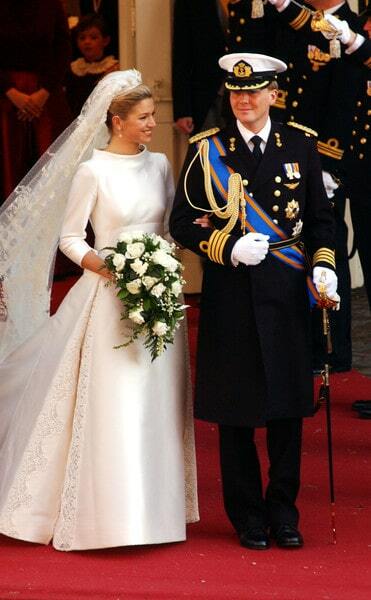 With an elaborate scoop neckline and cathedral length train, this wedding dress was perfect for the Princess. The tiara and veil complemented the gown and its train perfectly. This stunning lace full-sleeve wedding dress has beautiful detailing in the skirt as well. The tiara and veil, while somewhat understated, were perfect for this wedding gown. Designer Elie Saab does masterful work. His designs are timeless. And so is this lace wedding dress with a high scoop neck collar and 3/4 length lace sleeves. With the Princess’s hair in a perfect chignon with the attached veil, the look is stunning and perfectly complete. With a boat neck collar and short sleeve bodice, this wedding dress is perfectly and deceptively simple. The luxury of the silk fabric is quite evident. Speaking of which, her tiara is, of course, stunning. It calls for a more modest dress so as to draw the focus upward to the tiara. This is a wedding ensemble fit for a Queen. The V-neck bodice coupled with long sleeves with flutter cuffs and full size skirt. 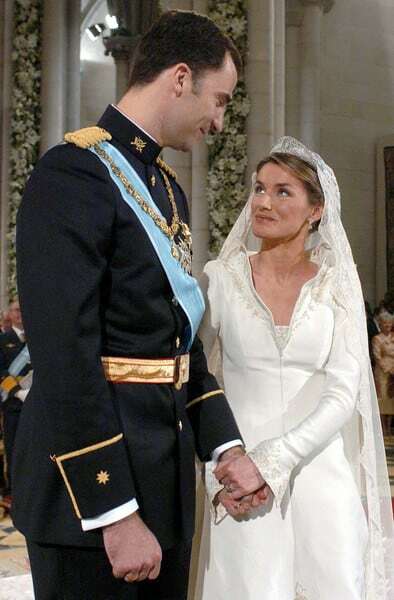 Queen Letizia is a model of perfection in this wedding dress and its accouterments. This wedding gown looks stunning on the bride. The pleated full skirt matches the tone of a Royal Wedding being somewhat conservative. The neckline is square shaped allowing for a beautiful focal point. The tiara and veil were stunning, of course.